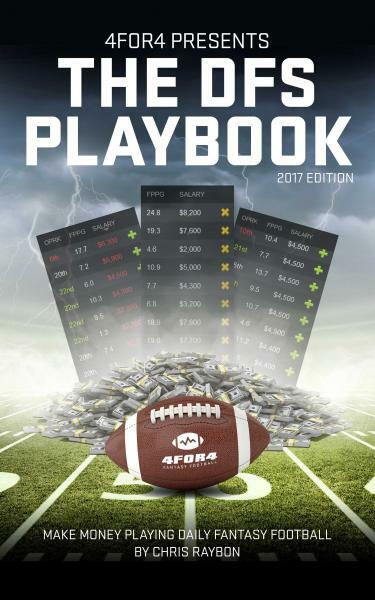 From the minds at 4for4 Fantasy Football, long known for their forecasting accuracy, comes The DFS Playbook. 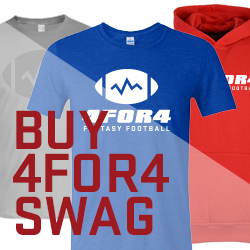 Chris Raybon and 4for4 Fantasy Football team up to bring you everything you need to know to get started making money in the fastest growing sector in fantasy sports history. Winning in the NFL boils down to which team can better execute their weekly game plan. The DNA for game plans is often established months, even years, in advance, and is all contained inside perhaps the most sacred item in the NFL: the playbook. Since knowing the playbook is a prerequisite to being able to successfully execute your team's weekly game plan, studying it during the offseason is crucial, as there will be little time to during the weekly grind of the season. Daily Fantasy Sports (DFS) is very similar to a season-long league. Each DFS site (such as FanDuel, DraftKings, etc.) has a salary cap, and your goal is to assemble the highest scoring group of players for that week only that fit within the cap. Therefore, each week you need a game plan for constructing the best lineup given the matchups and player salaries. Most of your time during the season is best spent researching players, analyzing salaries, keeping up with new developments, and ultimately crafting lineups. But you better know your DFS playbook too. Think of it as a collection of strategies, philosophies, and overarching concepts that you draw from throughout the season to create winning lineups. The Quickstart Guide is intended to get you signed up, deposited and playing quickly. Think of it as a 10,000 foot view into ideal beginner game selection and bankroll management. We’ll give you a blueprint to minimize risk while building your bankroll and becoming familiar with the finer details of daily fantasy football. How volatile is the position, and how does this dictate how much salary we should allocate towards it? Which statistic(s) are the most relevant? How do the different types of game situations influence the likelihood of scoring fantasy points? How can I extract value and construct winning lineups? How Much Does It Cost & Where Do I Buy? We keep things simple 'round here. The eBook costs $4.44 and the paperback costs $14.44. Get it for FREE if you're an Amazon Kindle Unlimited subscriber. @RotoDub @ChrisRaybon he's helped me make some serious $$$$. @ChrisRaybon the stuff you are putting out right now is blowing my mind. Thank you! @ChrisRaybon Anyone planning on playing NFL DFS that isn't reading your work, are doing themselves a disservice.